Suffering from dry palms can be the result of many different things. If you work with harsh chemicals or cleaners without hand protection, you live in dry weather, or fail to use moisturizer, then your hands may take a beating. Sometimes, it may be the sign of a health condition and need further evaluation or treatment. This article lists some of the common causes of dry skin on the palms and hands, and some tips to help manage this condition. If you live in an area with a dry climate, your skin may become very dry. This may cause dry skin on your palms, the soles of your feet, and other areas of the body that don't usually become dry. You may also have trouble with dry skin on your hands and palms if you don't moisturize your skin frequently. Symptoms: Dry skin on your palms may appear as cracks and flaky skin. They may be very itchy, and you may even develop redness with extreme dryness. Treatments: For dry palms, it works well to use a thick emollient cream that contains dimethicone. This will help get moisture into the area and hold it in. After your bath or shower, spread moisturizer on your hands while they are still wet. Before bed, put moisturizer on and wear white cotton gloves to bed. Chemical cleaners can be caustic to the hands. If you work with chemicals, harsh soaps, or cleaners and do not wear gloves, the chemicals can actually slightly burn the skin. This can also occur if you come in contact with poison ivy or oak. While the skin on the palms is tougher than other skin, it is also more susceptible to drying and cracking. Symptoms: Chemical burns or contact dermatitis on the hands causes red skin, burning, itching, dry and cracking skin. You may also have blistering and peeling on your palms. If the irritation is not taken care of, dry skin on palms can become infected. Treatments: The first step is to remove the offending chemical. Always use gloves when working with cleaners or chemicals to protect the hands. After exposure, wash your hands well, and apply moisturizer. Just like the rest of your skin, your palms can become sunburned if exposed to the sun for too long. When sunburn begins to heal the palms may dry out and begin to peel. Going out into the sun without sunscreen and not using after sun care products may cause your palms and hands to dry out. Just being out in the heat when sunbathing can make your palms dry. Symptoms: Sunburn to the palms of the hands can be very painful. There may be redness, blistering, and peeling skin. As the burn starts to heal, intense itching may develop. Treatments: Use sunscreen before each sun exposure. Try to keep your palms facing down when sunbathing to protect them from the sun. After you leave the sun for the day, use good aftercare products like Aloe Vera gel. Tinea is a yeast infection of the skin. 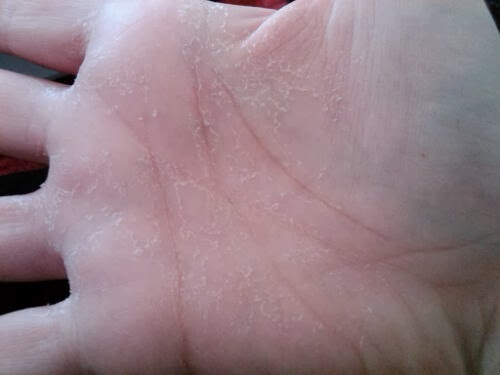 Tinea manuum can affect the palms of the hands and causes them to look very dry. This skin infection is caused by a fungus that grows in and on warm, moist areas of the body. It can also occur when you have immune system conditions or issues with blood sugar. Symptoms: Symptoms of a fungal infection include; dry skin, peeling, skin creases on the palm look like “powder,” severe itching, and redness. There can be blistering if the infection is bad. You may notice these symptoms in other areas of your skin. Treatments: You will need to see your doctor and they can prescribe an antifungal cream to use. Make sure you keep your skin clean and dry. Avoid touching sinks and toilets in public areas. If you suffer from psoriasis, it can affect the palms of your hands. Psoriasis is an immune system condition that has triggers such as stress, illness, and viruses. If you have flares that affect your outer hands, it can spread around to the palms of the hands. Symptoms of psoriasis include red, scaly areas, thickened skin, cracking skin, and redness. Treatments: If you have a flare that causes dry skin on palms, you will need to use a highly emollient cream on your hands to soften and moisturize the skin. Your doctor may need to give you topical steroid creams, or they may suggest using a coal tar shampoo. Keratoderma is a genetic skin condition and can also be seen with inflammatory conditions. It causes "keratosis" or very thick skin in the affected areas. Skin cells multiply rapidly, don’t shed, and form growths. Symptoms: Keratoderma on the palms causes yellow, thick skin on the palms, dry skin, cracking, and may even have a foul odor. Treatments: This condition requires large amounts of moisture creams, retinol (prescription), and keratolytic creams. This condition is often triggered by a virus or other infection. It can also be caused by certain medications. The palms of the hands and the entire body may break out in blisters, with severe dry skin and itching to the palms of the hands. Symptoms: The signs usually appear after an illness or use of certain medications. They include blisters, rash, dry skin on palms, and severe itching. The symptoms can persist for weeks, but tend to resolve on their own. Treatment: If caused by a medication, the drug is usually stopped immediately. Your doctor may suggest taking antihistamines for itching, and prescribe an oral or topical steroid.